Home » News & Events » Learn & Connect » What grows with restorative justice? What grows with restorative justice? The first time Chicago police officer Tim Crawford observed a peace circle, he was skeptical. Crawford (pictured far right) works with Bridging the Divide, a program of the YMCA of Metro Chicago. It was developed to help build understanding between youth, law enforcement officials, and other community members. “We’re building relationships with real kids out in communities who probably will have interactions with police,” he said. 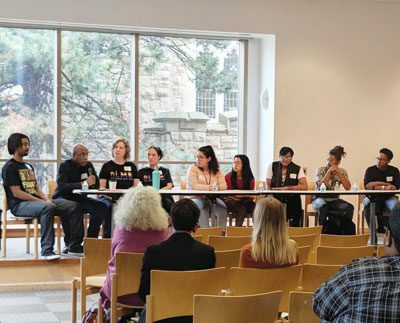 Crawford spoke during the closing panel of the Restorative Justice Youth Conference in October, a two-day event that brought people together for a weekend of workshops, peace circles, and panel discussions at the Main Library. Also on the panel was Darrius Lightfoot (pictured at left), co-founder of Fearless Leading by the Youth, which trains youth in community organizing. For a long time, Lightfoot said, he did not want to sit down with police officers in a peace circle. He didn’t think he could connect his everyday struggles with theirs. But after hearing officers say they also fear for their lives every day on the job, “I connected my struggle to their struggle,” he said. Lightfoot added that, for him, the work of repairing relationships is ongoing. Restorative justice is an approach that focuses on repairing the harm caused by crime. Repair means healing for the people directly involved, and for the community at large. “This model relies on proven techniques of forgiveness and empowerment, which are far more successful than our current system of punishment,” wrote participant Susan Lucci in a blog post after the conference, noting that the United States has the highest incarceration rate and largest prison population in the world. Over two days, restorative justice practitioners from organizations including Heartland Alliance, Catherine Cook School, and A.L.M.A. (Arts Language Music Alliance) led workshops and spoke on panels at the Main Library, sharing strategies they’re using. Peace circles are a key part of the approach. In a circle, those affected are brought to encounter one another, amends are made for the crime, and all parties are reintegrated into the community. 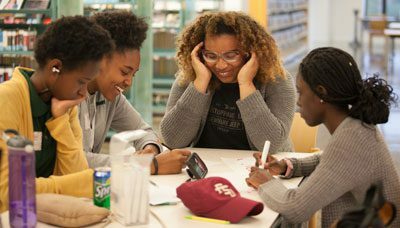 “The most soulful parts of the weekend were the opening and closing circles, where we were all seen, heard and connected,” Lucci wrote.